Prices as of March 2016, with taxes. Philippine Peso amount may vary depending on exchange rate. For more information on tickets, click here. 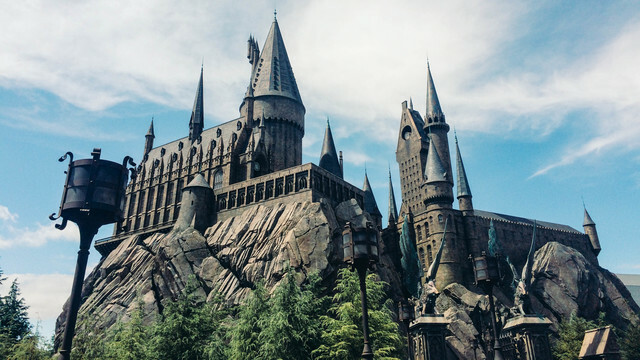 There is no separate ticket if you just want to experience the Wizarding World of Harry Potter (WWoHP). The attraction is already included when you buy the USJ pass. You can buy passes on the day itself at the ticket booths in front of the park. To avoid long lines at the booths, you can get tickets in advance if you’re staying at partner hotels or through travel agencies. If you check the list of travel agencies in the link, there are no official Philippine partner agencies. Through research, Filipinos can buy tickets through Voyagin or Reli Tours, it will be more expensive but very convenient. Do you know other agencies/partners that sell USJ tickets in the Philippines? Place your answers in the comments below. 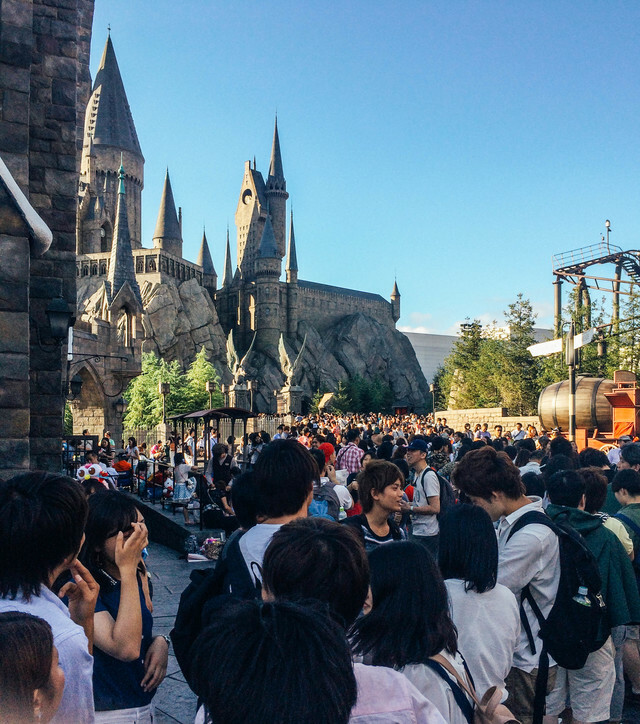 When my sister and I went to Universal Studios Japan, we had to wait in lines A LOT! It took us around an hour to purchase an entrance ticket and when we asked to buy Express Passes for the popular rides, they were sold out! With no Express Passes, we had to wait for two hours to experience the famous Harry Potter ride! To prevent this kind of situation, you can purchase entrance tickets and express passes in advance through discounted travel activity platforms like Klook or KKDay. What’s good about booking these tickets in advance is that it is at a discounted rate. You’ll save around P200 to P300 (or more if there are Klook or KKDay promos) per ticket. You don’t have to fall in line for the USJ entrance ticket and you can be assured of express passes so there will be no two hour wait for the most popular rides. 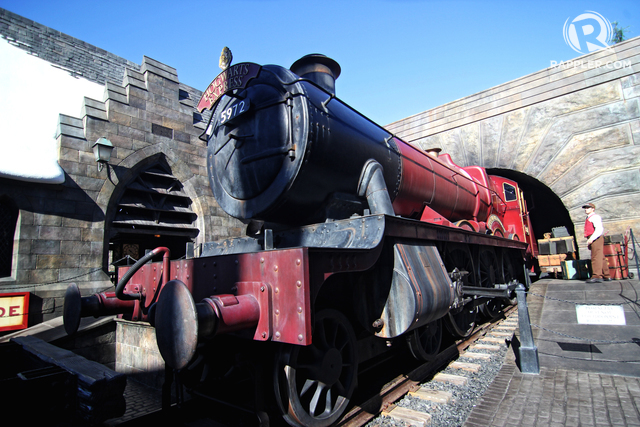 You also have more time to explore other attractions in WWoHP & USJ. Park operations vary and are subject to change depending on weekdays, weekends, seasons, or holidays. On an average, park opens at 9 am and closes at 10 pm. 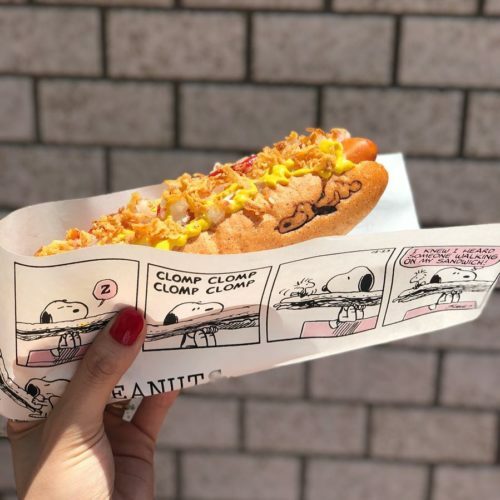 At times, they can open as early as 8:30 am and close at 7 pm. It should also be noted that sometimes the park starts admission even before opening time. For more information, click here. 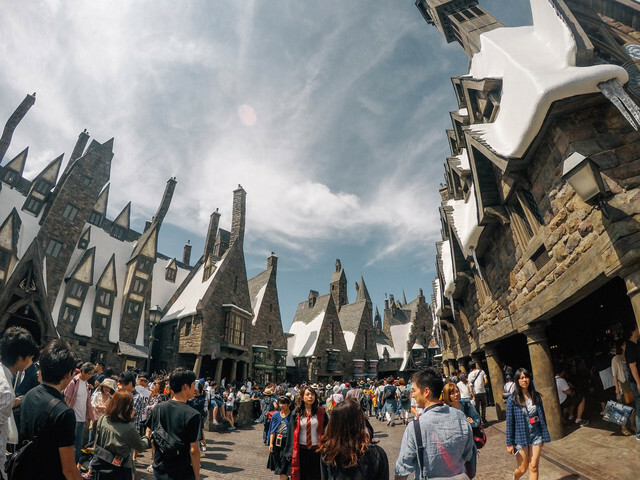 Since its opening in July 2014, the Wizarding World of Harry Potter (WWoHP) has been one of the most popular attractions in USJ. In 2014, most travel blogs and reviews would describe the attraction as having monstrous crowds from weekdays to weekends. To control crowds, the park set up timed tickets. 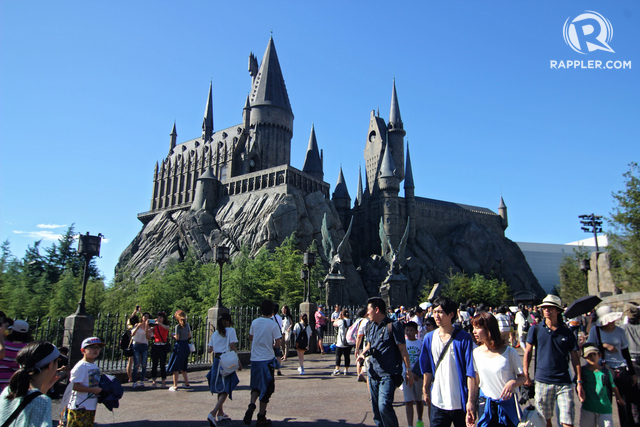 Once you enter USJ, you cannot automatically visit the WWoHP attraction. You need to get a timed ticket. Please note that timed tickets are not at the entrance of the WWoHP attraction (see here to know where you can get the timed tickets). My sister and I arrived at 8:30am at the ticket booths. Since we were not able to get tickets in advance, we had to fall in line. We were there on a Sunday so the line that met us at the front of the theme park was pretty long. After buying our tickets and taking pictures at the Universal Studios globe, we were able to enter the park at 9:30am. When we got to the WWoHP timed ticket booths, we were able to get tickets for 12:30nn. We can only enter the attraction at that time. In the 5.5 hours that we stayed at WWoHP, almost half of that time was spent waiting in line. If we ever go back to this theme park, we will never go on a weekend day or holiday. There was literally a line everywhere! Just expect that any activity that you do will most likely have a line. 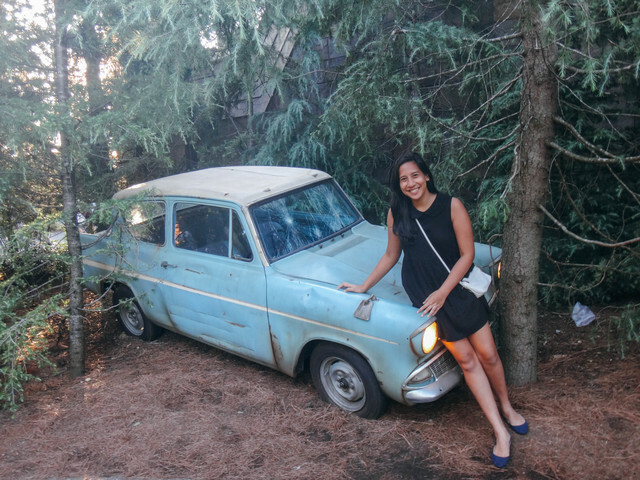 When we entered WWoHP, my sister and I decided to check out the most popular ride, Harry Potter and the Forbidden Journey. At the start of the line, regular waiting time was 240 minutes. We were so surprised because we had to wait for 4 hours to experience a 5 minute ride! After much thought, we finally decided to try it. We were already there, might as well try it, right? The line was really long. The snake of a line leads you to a lot of structures that resemble those of the movies (trees, greenhouse, and others). The line really tested our patience. Still, the ride was amazing and is really a must! For me, the line was worth it. Being positive about it, not only did I get to experience one of the best rides ever, I also got to value the act of being patient and grateful. Most of the guests that you will see at the theme park are locals. Aside from the street performers at WWoHP that were Caucasian, almost all the staff was Japanese. 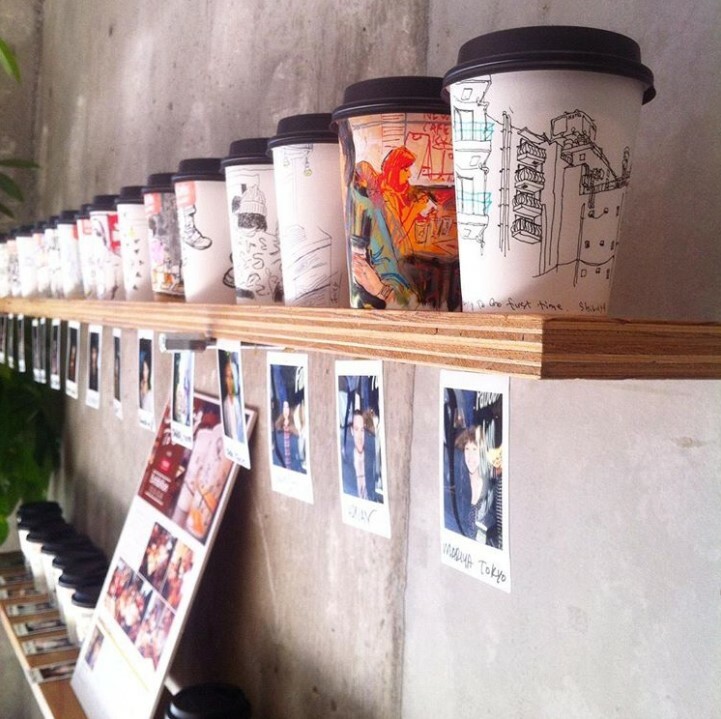 If at restaurants/merchandise stores, it is better to just point at what you want to buy. The rides are in Japanese as well. Even though characters from the actual Harry Potter movies were used, they dubbed the voices in Japanese. If you go on the tour inside the Hogwarts castle, the voices and show clips (Dumbledore, paintings, etc.) 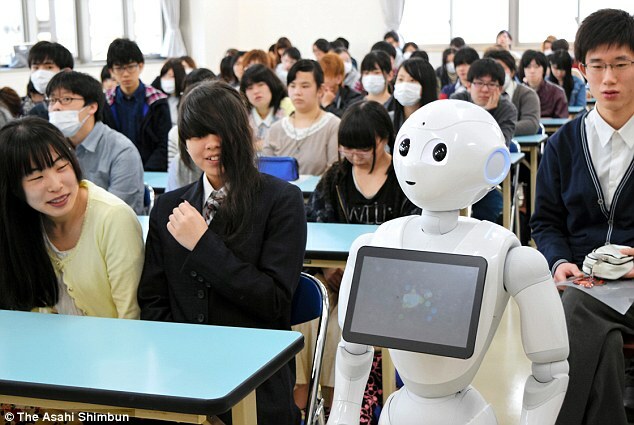 are in Japanese. Food and merchandise inside the park, not only in WWOHP, are very expensive. 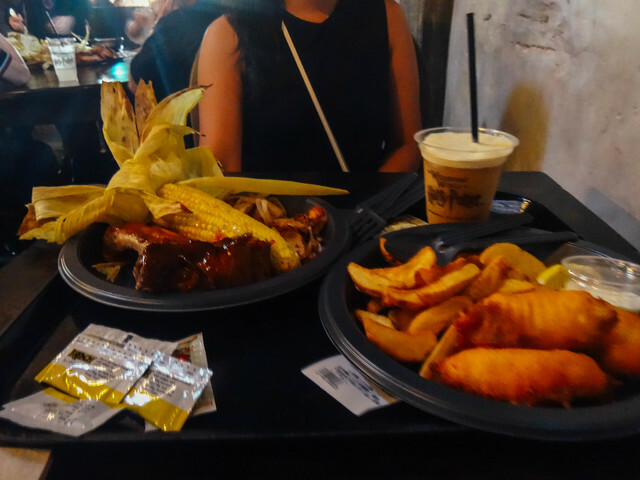 The meal that me and my sister had at the Three Broomsticks restaurant cost us ₱3,500+. Those were just 2 plates of food. 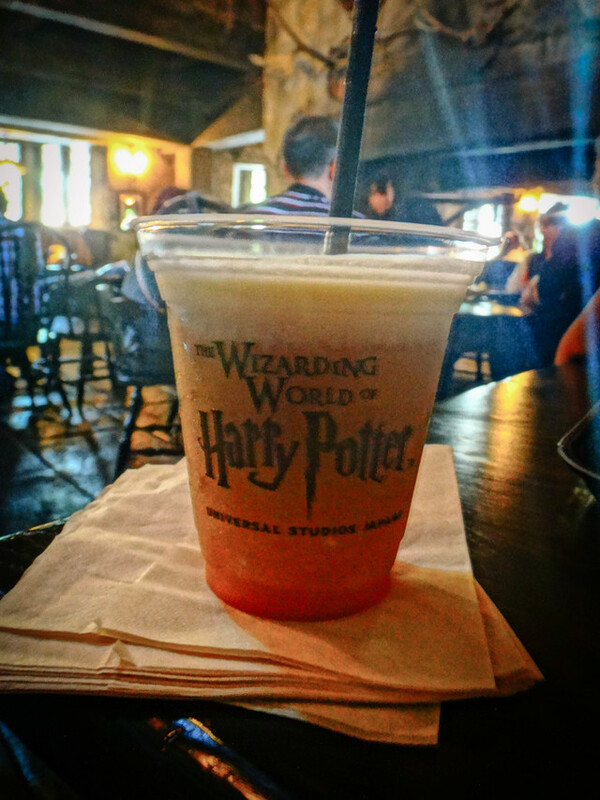 The famous butterbeer inspired by the movies costs around ₱250+ for a regular cup and ₱450+ if you want it with a souvenir plastic beer mug. You can also have it in a frappucino style (frozen butterbeer) costing around ₱290+ for a regular cup and ₱500+ if you want it with a souvenir plastic beer mug. At Honeydukes, aside from the crazy long lines to get in, products are crazy expensive. 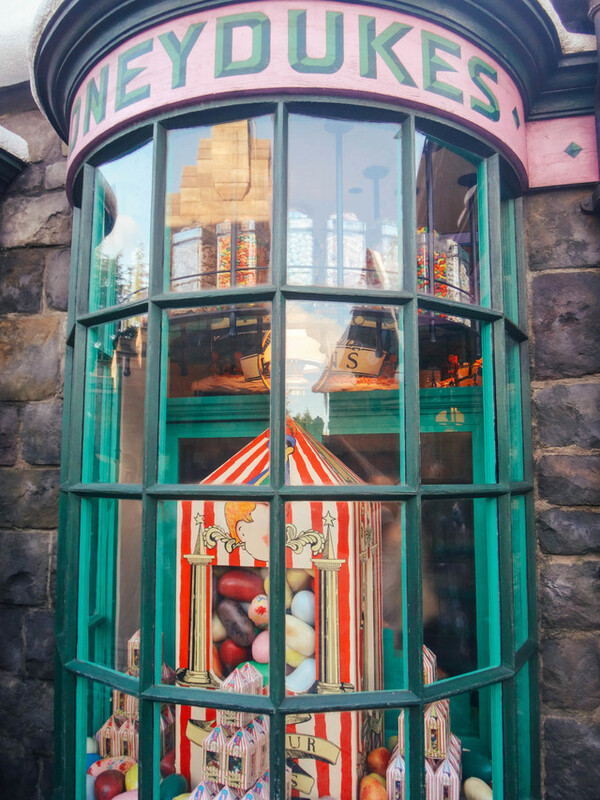 Chocolate Frogs cost ₱497+ each and Bertie Bott’s Every Flavor Beans are priced at ₱745+. 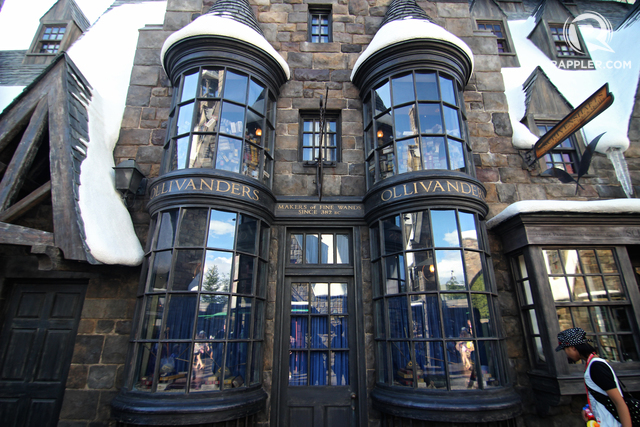 At Ollivander’s and USJ gift shops, wand prices start at ₱1,480+. Other merchandise like house scarves cost ₱2,000 each and Hogwarts cloaks are priced at ₱5,400. It is very costly to become a witch or a wizard (or look like one). How we wish that we followed this tip! Go on a weekday and as much as possible, don’t go during holiday seasons. My sister and I were not able to maximize our experience because of long lines. We couldn’t enter Ollivander’s or Honeydukes because of the 2 hour wait JUST TO GET INTO THE STORES. Because of the long lines, we were only able to experience 1 or 2 attractions in the morning in USJ and WWoHP the rest of the day. Arrive at the park 1 hour before opening time. 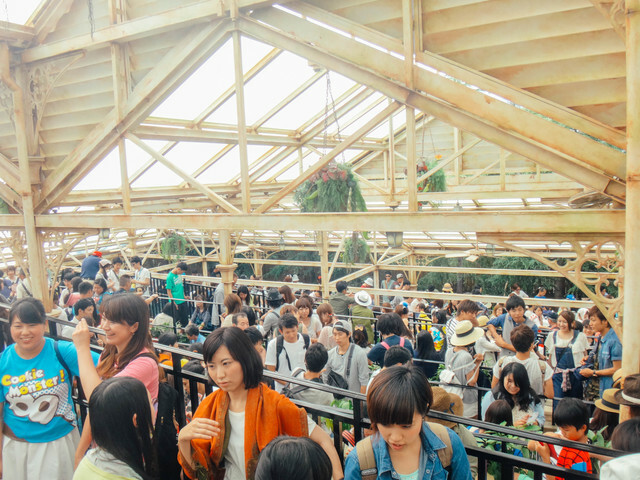 At this time, you will already see lines – lines at ticket booths and the entrance. Arriving early will also give you a chance at a good spot at the start of the line of the entrance so once the park opens, you can run to the WWoHP timed entry tickets, and get yourself an early time slot (there are instances that you might be lucky and you don’t need a timed entry ticket to enter). Philippine Peso amount may vary depending on exchange rate. For more information on tickets, visit here. At the front of the line, my sister and I were so jealous of those who got to enter the Express Pass lane. I think they would just have to wait 5 to 15 minutes for them to experience the ride. Please note that express passes do run out. On the day we went to USJ, we planned to buy Express Passes but when we got to the ticket booths, there was a sign that indicated that Express Passes were already sold out. Once you enter WWoHP, you will really be overwhelmed. 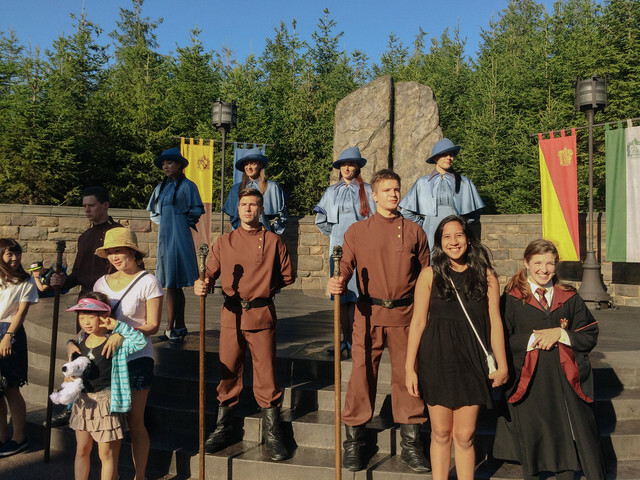 If you’re a die-hard Harry Potter fan, I’m sure you’ll feel goosebumps everywhere. 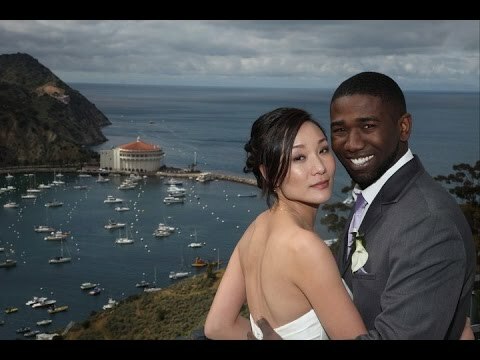 You will really feel that you are in the movies. If you visit the website beforehand, you can find this studio map. 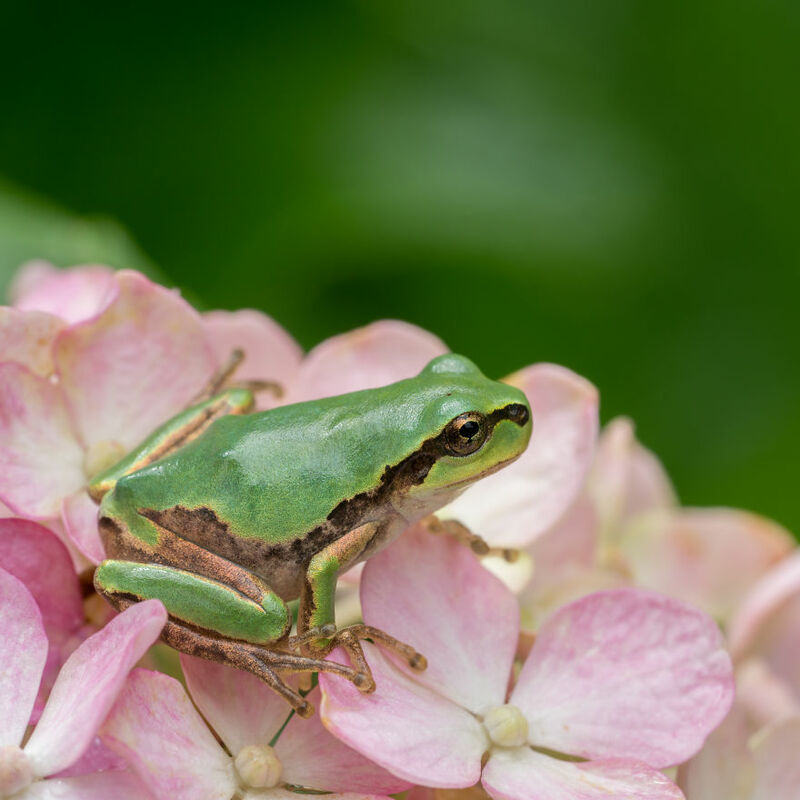 Familiarize yourself with the attractions and prioritize what you want to see or do first. It would be best to start with attractions that are popular and tend to have lines that build up. 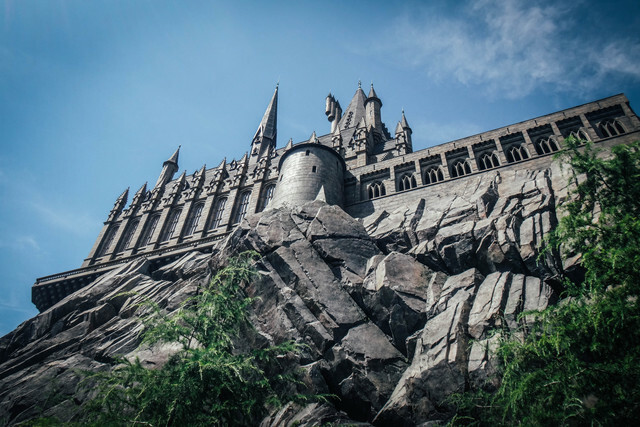 Try this route: start with Harry Potter and the Forbidden Journey, a tour of Hogwarts Castle, Flight of the Hippogriff, eat at Three Broomsticks, Buy ButterBeer at Hog’s Head, and do your souvenir shopping at Honeydukes, Ollivander’s, Zonko’s, and others. 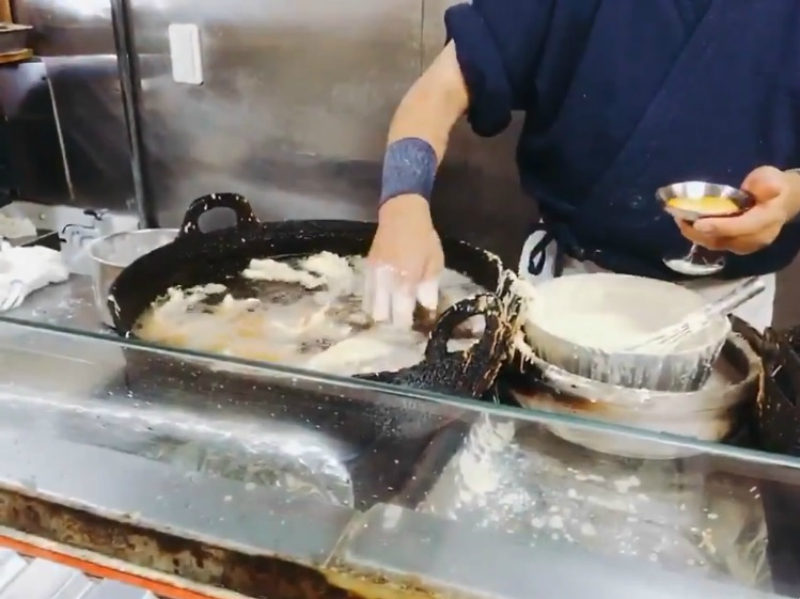 Once you’re done with most of the activities you want, sit back and relax at the sides – people watch, take photos, and stare at the amazing magical world you’re in. Irene Maligat is a grateful traveler. One of her main goals in life is to inspire and empower a lot of people to travel gratefully. Her passions are sports, reading, motivational writing, travelling, and events planning & management.